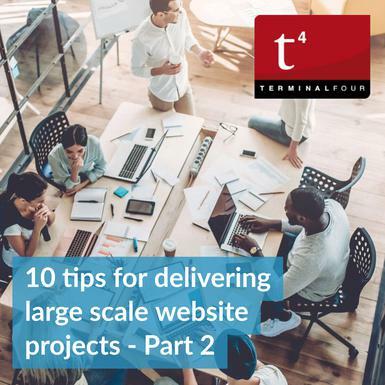 This is part two of our advice on running large scale web projects. In this post we have compiled 5 top tips from the TERMINALFOUR project team. Part 1 can be found here. 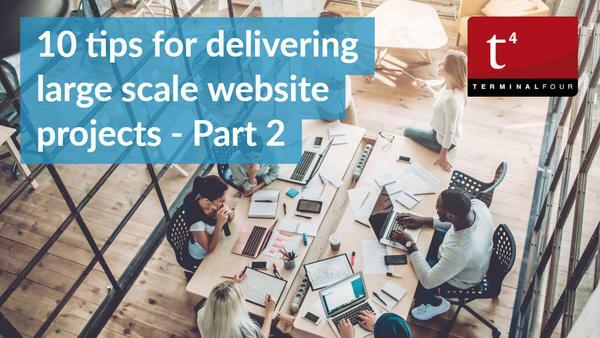 Whether you are about to embark on a full scale digital transformation project, website re-development or starting something smaller, they're points you can consider to ensure you get a successful outcome from your project. Your requirements are the foundations of your project. When we look back, projects which have been tightly defined tend to be the ones which were delivered on time and on budget and don't suffer from scope creep. New features or design templates at the design phase will have a direct impact on implementation and build time. Think of the third party systems you will need to integrate with. Talk early to the technical people who manage those systems. Decide early on the browsers you wish to support and accessibility levels you wish to confirm to. It is not specific enough to just say "we will support all modern browsers and mobile devices". How do you want to work? Using an agile development methodology is a very modern approach and productive way of working but it can fail if it doesn't match your team culture and normal ways of working. Always assume that changing the scope will impact timelines, especially after the scope has been "signed off". When you work with us, our business analysts formalize this information in a functional specification. This is the go-to document from it is creation to the end of the project and ensures everyone involved with the project is on the same page. There is usually a common thread in large scale web projects. And it is that the level of effort required for the content workstream is underestimated. Developing content can be very time consuming. A good place to begin is to analyse and categorise the content already in place and rank it by quality and importance. The output from this work can be used to help make decisions around migration versus developing new content and to estimate the amount of work involved. If you are embarking on content re-development then the earlier this is started the better. Infact it is every UX specialist and digital designer's dream to have realistic content at the wireframing stage of a project as an input to the layout decisions. But it rarely happens. Crafting high quality content for each template early on in the project could really help to maximise the quality from this wireframing activity. we have also found it can be a good idea to appoint a member of the University team to take responsibility for content as part or all of their role throughout the project. You should always be able to justify and give a reason for decisions. This is particularly important through the wireframing and design phases as opinions tend to be plentiful. We put the user experience at the centre of decisions, and cite examples from previous projects. Where it is possible it is worth backing up UX and design decisions with user research, information from behaviour tracking software like HotJar and data from platforms like Google Analytics. Wherever possible we have found it best to 'show' rather than 'tell' when consulting stakeholder groups. Whether it be through linking wireframes or designs to create user journey examples or through building prototypes to provide a demonstration across devices, the more demonstrative approaches engage and explain website decisions effectively. Because large web projects are complex, they require a more structured project management process than smaller projects. However, if a methodology isn't working, then it can make sense to adapt or tweak an approach to work with the habits and working practices of others on the project and to remove barriers to progress. Without a doubt this needs good quality team working and communications so everyone involved understands why the process has been altered and to explain how this fits in with bigger picture objectives. 10. Testing and Phase handovers. Understanding the phases of the project and stage gates is imperative. Take a moment to consider the following points early in the project and it will keep the wheels moving later on. What is the focus point of the sign off at each stage - what is being signed off? What impact does it have if we then decide to make change requests? Who is the best person to sign off each phase of the project? In terms of testing, it takes many different forms and can be conducted at different stages of the project. There needs to be a clear understanding of what is to be achieved from testing, how it will be conducted and what time will be allocated to making feasible changes based on the feedback. Set clear expectations, early on, that senior leadership will not be involved in the day to day sign off of decisions. If you have to sign off operational details with a senior management board or high level project board then the project will move very slowly. A recent and very successful project, where the site was launched within 6 months of commencement, expectations were set with senior management that they would only get to see one sample design and only major concerns would be taken into consideration. While this sounds strict, setting that expectation meant that the project team could maintain a high level of momentum. On a large site there can be multiple rounds of in-depth testing across devices. Consider whether you've allocated enough time in the schedule for testing, issue resolution and changes. Is everyone clear on the browser and device support being provided. And is there clarity about the line of acceptance with respect to testing? We have only scratched the surface of this topic. But our aim in sharing the strategic advice from our clients who have been through large scale web projects, and the TERMINALFOUR team who live and breathe projects, is that we can help you navigate a successful path through your future digital initiatives. If you've missed part 1 of this article, we have 5 more insights from our clients available here. In the meantime, we'd love to hear your views. What has been fundamental to making your projects run smoothly?